Souad al-Masri had just left the national hospital in Maarat an-Numan where her 13-year-old son Mounir was receiving treatment, when the building was hit by an airstrike. There she found her son lying on a bed with several other children, all covered with thick blankets. “The house was cold and very small, the injured and patients were whimpering in pain. I thanked God my son was ok,” Souad said. Mounir was later transferred to another hospital on the border where his situation was stabilised. Airstrikes are continuing to target what medical facilities remain in Idlib, with doctors warning of a “catastrophic” impact on much-needed services. Mazen as-Saoud is the dean of medicine at the Free Aleppo University and was previously the director of al-Quds Hospital before it completely destroyed in February 2016. “The Syrian regime air force and its Russian ally launched unprecedentedly severe attacks targeting this region in January 2018,” he said. “Hundreds of civilians were killed and thousands injured as a result of this campaign which targeted the most vital locations in villages and cities and caused horrific massacres. Hospitals, medical centres and civil defense headquarters were all targeted,” the 57-year-old continued. 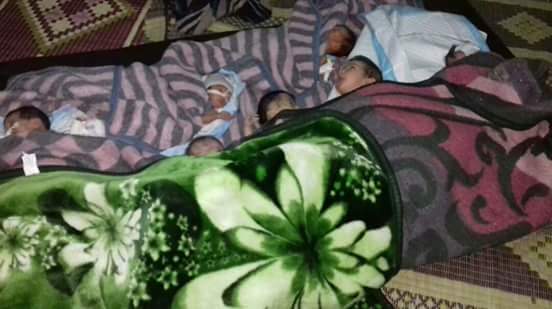 In the face of this crisis, a group of doctors and activists launched an initiative to turn private houses in Idlib Rif into emergency medical centres where those wounded in airstrikes can receive first aid before being transferred to hospitals in Darkoush, Oqairbat and Bab al-Hawa. “These houses lack the medical equipments needed, but they help us a lot in stabilising patients’ conditions, at least until they are transferred to hospitals further away,” as-Soud explained. As -Saoud also praised the efforts of the Turkish authorities for opening up their borders to allow the wounded to be transferred to hospitals in Turkey. Many lives had been saved in this way, he continued. One of the most severe problems was “a general state of confusion and panic regarding how to help those stuck under the rubble,” he said, recalling an attack on Maarat an-Numan in February 2018 which destroyed many homes and led to raging fires. When the fire fighters tried to put out the conflagration, airstrikes targeted those same locations again. Al-Zikra said that this meant that this tactic had put many civil defence stations out of use, including in Ariha and Saraqeb. In Khan Shaikoun, he continued, the stations had been leveled to the ground, all their vehicles destroyed and three of its staff members killed and four wounded. Medical facilities put completely destroyed by this latest campaign on Idlib and its Rif include the Odey Hospital in Saraqeb, the Sarja medical centre and the Saraqeb blood bank as well as the Kfar Nabel medical dispensary and Meshemshan’s primary care centre. Zaher Hannak, 41, is the former director of the Kfar Nabel surgical hospital, another facility which was wrecked by bombing. He said it was targeted by up to five airstrikes, injuring several medical staff as well as many patients. Hannak explained that “the campaign aimed at increasing the level and amount of people’s suffering, particularly in terms of transferring the wounded to the nearest medical facility, so targeting hospitals this way led to an increasing number of casualties”. This strain on resources meant that people needing planned rather than emergency procedures had only two options.